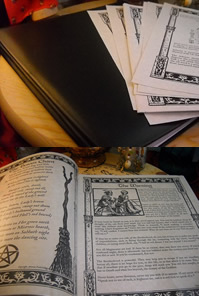 This compilation represents our current Book of Shadows -- 100 original sheets made by Asteria Books/Blade & Broom Botanica. This PDF version prints with a blank background so you can print on any paper you choose. The ones in the picture are printed on ivory parchment paper. This 100-page compilation includes the first 100 pages offered Blade & Broom. You can also purchase smaller thematic sets in our Etsy shop. NEWS for NOVEMBER 2015: Laurelei is working on a MASSIVE push to create more stunning BOS pages. When completed, Asteria Books will have over 750 single sheets available. We will be making these available individually and in thematic sets as they become available. These BOS pages are like no others that are available anywhere -- on or offline. These leaves from the Book of Shadows are pulled primarily from the American Folkloric Witchcraft Tradition and are published exclusively by Asteria Books. PDF copy for instant download. Print on your own paper, or keep as part of your digital BoS.